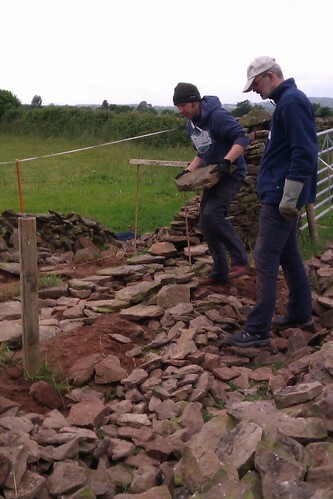 A couple of weekends back (yes, I’m a bit behind with my blog posts), I went on a two-day introduction to dry stone walling, run by the fantastic people at the South West England Dry Stone Walling Association. 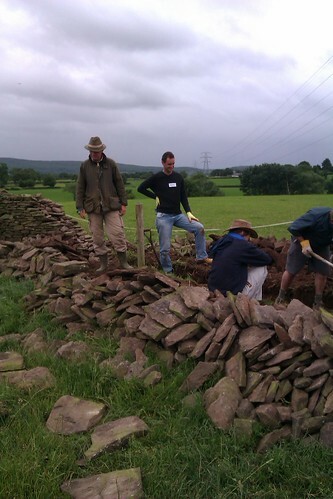 I’d been nurturing a vague interest in dry stone walling for some time, so when I saw that there was a course on (quite literally) just down the road, I felt that it was some kind of sign – so signed up! 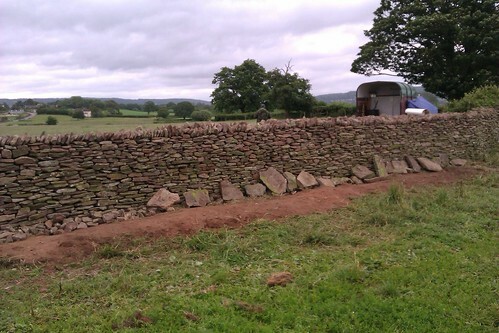 In case you haven’t come across dry stone walling before, it’s the craft of (as the name suggests) building a wall from stones, but without using any mortar. 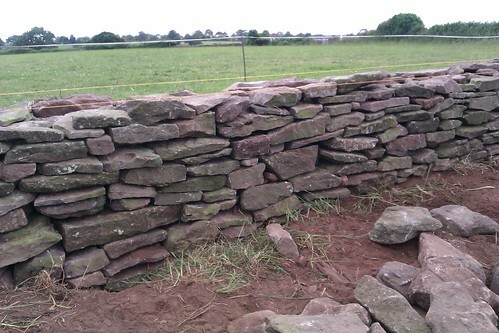 Dry stone walls are common in many parts of England, particularly in agricultural areas. Because the geology of each area is different, the style of walling varies to take account of the characteristics of the local stone. 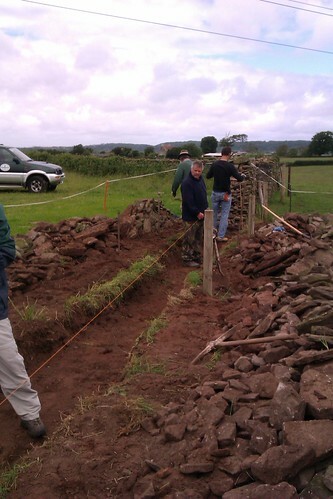 Our task on the course was to dismantle an old wall (i.e. the one built by the people on the previous course a few months ago) and rebuild it from scratch. 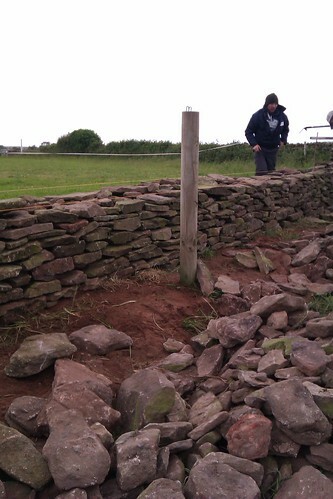 The first job was to take down the old wall down and to dig out the large foundation stones. It’s important to build directly onto the inert subsoil, as the topsoil is still breaking down and does not, therefore, provide a stable base. This means lots of digging. 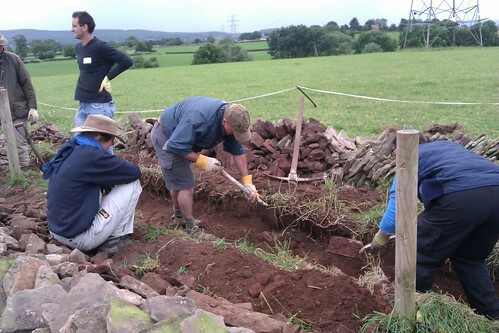 With our trench all marked out, we started relaying the foundation stones. 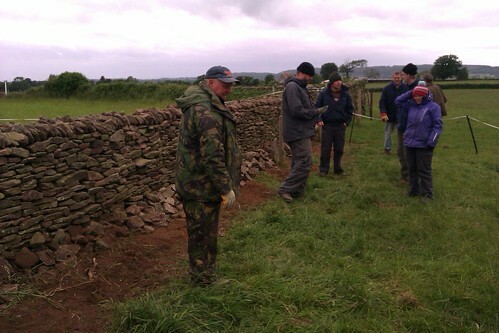 We each worked on one section of one side of the wall, so we soon got to know each other quite well. And the agony of lugging massive stones around created an odd kind of bond in seemingly record time. Thankfully, it was soon time for lunch. 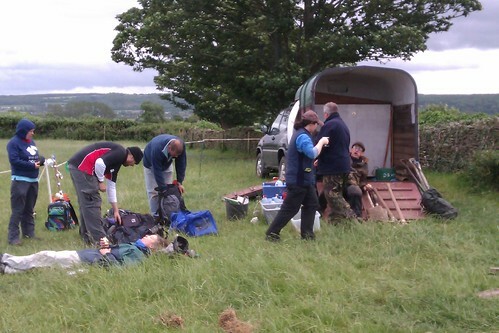 The course instructors were well prepared, with a gas stove to boil water for tea and a converted horse box with a toilet. (Yes, you read that correctly. It’s behind the white partition in the photo below.) To be honest, after weeks and weeks of doing ‘work’ work, I was really enjoying just being outside and doing some manual labour. I don’t know why, but it just feels more honest, somehow. Inevitably, we were soon back at work. 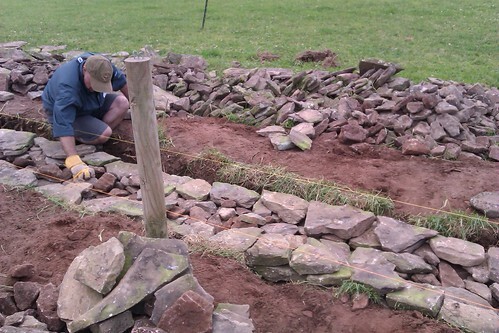 By this stage, the wall was starting to appear above ground level (always helpful in a wall) and we had to make sure that all of the stones were well fixed and didn’t move around. (The trick is to insert smaller stones from behind to get a solid fit.) While some parts of the country have lovely, uniform chunks of stone, the local pennant sandstone around here appears to be somewhat random. But if you look hard enough, I found, there’s almost always a stone to fit the gap you’re struggling with. By the end of day one, our wall was almost certainly recognisable as such. Admittedly, it wouldn’t yet keep the cows in (I forgot to mention that we were working in a cow field, with the cows paying particular attention to our activities), but it was most definitely getting there. You can see in the photo below how the stones overlap to create a solid structure. The mantra, apparently, is ‘one on two, two on one’, to make sure you don’t get any weak points. Admittedly, there are some fairly sizeable gaps between some of the stones, but please don’t forget that we were beginners, and so should be permitted a certain amount of leeway in such matters. 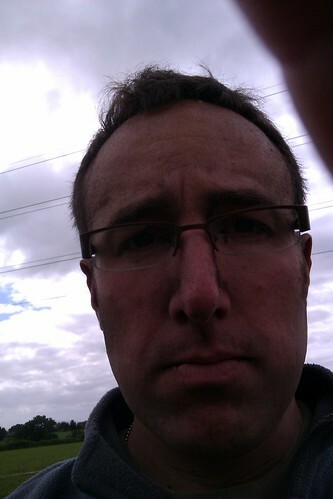 We were also fairly mucky by this stage, as the wind had been blowing the dirt around in little dust devils. I didn’t realise until I’d walked home quite how much like a vagrant I looked. Which explained why the wedding party I’d passed at the church had given me such a wide berth. In fact, I didn’t really get properly clean until about three days later. On day two, we soon got cracking in adding height to our wall. By lunch time, it was already approaching the correct height – about 1.2 metres. And it hadn’t yet fallen over, which is always a good sign. Next step was to add stones along the top, each tilted at 45 degrees. These help to stop the stones along the top from falling off, but mostly just look pretty. With this final task done, we stepped back and admired our handiwork. We were, to be honest, all feeling a little bit pleased with ourselves. All except the chap in the camouflage jacket in the photo below. He’s Jon and he was our chief instructor. And he’s clearly wondering how he’s going to explain to the farmer why his perfectly good wall has been demolished and replaced with this rather wonky one. In all fairness, I think our wall looked fairly good. Well made dry stone walls can last for millennia, so hopefully ours will survive at least until the next course comes along and rebuilds it. 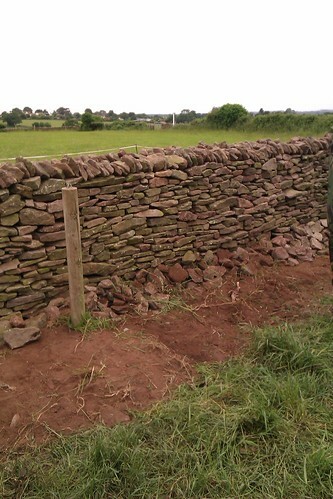 This entry was posted in Dry stone walling, History, Photography and tagged Crafts, Dry stone walling, Farming, History, Nailsea, Outdoors, Photography by Simon Perks. Bookmark the permalink. I like stone walls. I think they give a continuity to the generations that live on the land around them. Just out of curiosity, did you leave a note with your name and date wrapped in waterproof plastic somewhere inside the wall? I didn’t, but I did leave a coin with this year’s date on it in the middle of the wall. I asked the instructor about this sort of thing and he said that when they do a big project, they prepare a metal plate with their details on it and leave that in the wall. 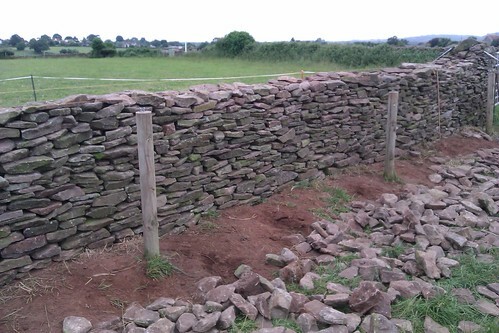 If I get into dry stone walling regularly (which I might well do if I can figure out how to fit it into my schedule), then I can definitely see myself doing something similar.